As a public service, I would like to remind you that Mother’s Day is just three days away! As a marketing service, I would also like to remind you that 35% of all flowers sold in the year will be purchased in the next three days and that 66% of people buying a Mother’s Day gift will purchase flowers. How is it we have found ourselves in this flower buying frenzy on the second Sunday of May? Ever since 1914, it has been designated as the official day to honor your mom when President Woodrow Wilson made it a national holiday. But Mother’s Day has much deeper roots than the Wilson administration. Just how did the day come about? And why do we buy so many flowers year after year to celebrate mothers? There are several traditions that honored mothers. Some of them were tied to great social causes, like the abolition of slavery and women’s suffrage. Others were designed to rally mothers together for the cause of peace. Each of them had one thing in common: they recognized a mother’s very significant influence by giving them flowers. One of the earliest Mother’s Day was a Christian holiday associated with Lent. On the fourth Sunday of Lent, Mothering Day was a time when observant Christians went back to the church where their mother first took them as a baby. This was known as your "Mothering Church.” It was customary for children to present their mothers with flowers to wear to church on Mothering Day. This day was especially popular in Britain. There are several women who helped start Mother’s Day in America. Temperance leader Juliet Calhoun Blakely rallied women to ward off the evils of society against their children in Albion, Michigan. Julia Ward Howe of Boston wrote a Mother’s Day Proclamation in 1870 in the name of world peace. Both have been tied to our modern day Mother’s Day. However, there is a familial connection between two women and the proclamation by President Wilson in 1914. Just after the American Civil War, Ann Reeves Jarvis of West Virginia organized Mother’s Day Work Clubs and the Mothers Friendship Day which promoted reconciliation between Union and Confederate soldiers. After Ann Jarvis died, her daughter, Anna Jarvis began a Mother’s Day celebration in Philadelphia to honor not only her mother, but the sacrifices of mothers everywhere for their children. She suggested that children wear a white carnation in honor of their mother and attend church with her on the second Sunday of May. 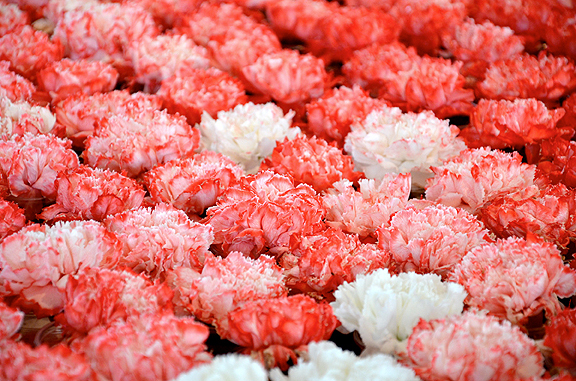 That first Mother’s Day celebration saw 500 white carnations delivered to a Methodist church that Jarvis attended. The event caught on throughout the states. Florists and department stores provided financial backing to Jarvis as she petitioned the president to name Mother’s Day an official holiday. The day became so commercially successful with florists that Anna Jarvis later regretted that she had a part in making it a national holiday. She felt like the commercialization of the day had taken away its true meaning and tried to get the president to renounce it. Of course, this never happened because, despite Anna Jarvis’ ill feelings towards the commerce tied with the day, most people like giving flowers to their mothers and mothers appear to like to receive them. In many ways, it is the perfect marketing scenario. Year after year, we purchase flowers for mom. Today, Mother’s Day flower sales has grown into a $2.4 billion venture in the U.S. It is second only to Christmas for flower sales. So here is a word of wisdom: if you intend to purchase your mother flowers before Sunday, I would suggest you get to it. They are flying off the shelves! If you are one of the very few who didn’t plan on buying flowers for your mom… go buy your mom flowers! It is traditional. It is heart warming! It is the perfect marketing scenario.